Tree pruning can be a complicated, time-consuming endeavor that can ultimately do more harm than good if done incorrectly. To ensure your trees are pruned the right way to promote growth and disease resistance, call our experts at (817) 717-7737 for a tree cutting service in Forth Worth, TX that will ensure healthy tree growth and extended life. When your trees have seen better days, call our experts for a professional tree trimming service. While simple pruning procedures and trimming updates can be done on your own, you should call a professional for any other situation. Perils such as nearby power lines, branches hanging over your roof, and weakness inside the tree can be spotted and easily planned for by an experienced tree trimmer. 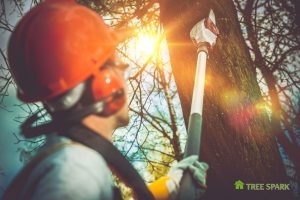 Call the Tree Spark professionals when you need tree trimming that’s more than just a simple touch up for service you can rely on. There are a few telltale signs that mean your trees need some attention. If you can see tree limbs and branches hanging over your home, you need tree pruning services. likewise, if you have noticed an unusual amount of dead branches sticking out of your tree, having them cut off by a tree trimming service can greatly reduce the risk of dangerous limb falls and tree disease. If your trees have gone more than three years without professional care, it may be time to consider an expert tree trimming service to trim the unnoticed or unseen blemishes from your trees before they cause problems. Pruning your trees will promote better resistance to tree diseases that can cause defoliation or fire blight offering your tree an extended, healthy life. Pruning dead limbs and branches will also help strengthen your tree and protect against storm damage for both your tree and your property. Tree pruning removes dead or dying limbs that can be an eyesore and can cause damage during times of high winds and storms. Properly pruned trees have a plethora of benefits that can help increase its lifespan and enhance its appearance. Professional pruning services help to ensure your trees are properly trimmed and groomed for maximum life and health. When you need professional tree cutting service in Forth Worth, TX, call the experts you can trust at (817) 717-7737 for quick, reliable service. Updated on August 31, 2018 at 4:50 pm by Tree Spark.